Posh midfielder Gwion Edwards runs at the MK Dons defence. Photo: Joe Dent/theposh.com. Peterborough United bowed out of the Checkatrade Trophy with a whimper tonight (October 4). 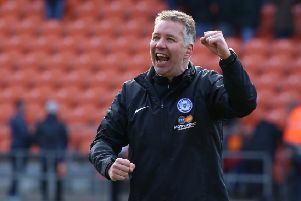 Posh were beaten 1-0 at home by a weakened MK Dons side at the ABAX Stadium to make it two defeats in two games in the revamped competition. Posh defender Andrew Hughes marks MK Dons' Dean Bowditch. Photo: Joe Dent/theposh.com. It would have been a much heavier defeat but for the brilliance of Posh goalkeeper Luke McGee who made a string of fine saves.